Why choose Doingart solar ground lights? Doingart 4 Pack solar powered lights are the perfect outdoor lights for paths, driveways, gardenn, etc. Because they're solar powered, you don't have to install wiring or worry about changing batteries. Just press the heavy-duty molded plastic stakes into the ground wherever you need lighting at night. With their built-in 1000 mAh batteries, these lights will provide 6 to 8 hours of light after 8 hours of daytime charging in the sun. 1.For best results, this product should be installed on the place where the sunlight shines directly on. 2.Do not install it under the shadow where there are obstructions, such as trees, eaves, windowsill, etc. You can find lights that are similar to these, but at Doingart we have good reason for thinking ours are the superior brand. First, our lights have 8 LEDs for more brightness (competitor's lights have 3 or 4). ☀►PERFECT GROUND LIGHTS. 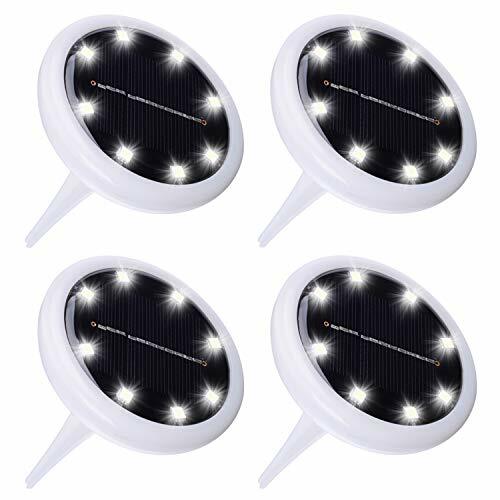 4Pack high quality solar ground lights. Just place wherever you need lighting at night. No wiring or batteries to replace; uses free solar power. Elegant design---The perfect lights for your front path, driveway, garden, etc. Make your outdoor nights more cool and beautiful! ☀►BRIGHT AND EFFICIENT. [2018 Upgrade ground lights] Each light has 8 white LEDs to provide lots of illumination from a low profile compact light. 7 color changing in the edge. Provide 10-12 hours of light. ☀►EASY TO INSTALL. Installing these solar powered yard lights are easy to install. Just press the heavy-duty molded plastic stakes into the ground. they're weatherproof. ☀►BUY NO WORRIES. 100% Satisfaction guarantee and reliable customer service within a 24 hour time support. Any questions with these solar lights - 60 days free return & 360-day free replacement warranty.